2017 was a phenomenal year for KLS Earthworks & Environmental. Our company branched out further into oilfield remeditation, completed more decommissioning & demolition projects, diversified our offerings by starting a new Underground division and by the end of December acquired Calgary Aggregate Recycling Ltd. We also completed numerous unique projects such as the Fish Lake campsite conversion, a hexavalent chromium remediation and the excavation and underground services for the new WestJet wide body hangar. 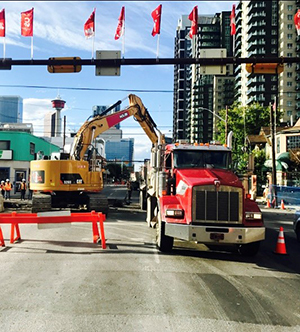 Further to this, we completed a milestone project – the 162nd Ave and Macleod Trail Double Diamond Interchange – the first of its kind in Western Canada – which we had continually worked on for the past 2 years. Our largest accomplishment though was successfully bidding – and winning – the Women’s Coulee High River Flood Mitigation (Phase 2) project, KLS’ most valuable project to date. We began this complicated and expansive Underground project in November 2017 and it will be completed at the end of March 2019. We would like to thank all of our employees, clients and vendors for your support in 2017 and making it a banner year for KLS Earthworks & Environmental.